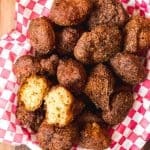 Southern Hush Puppies are deceptively delicious little bites of cornmeal batter flavored with a little grated onion and dropped into hot oil until the outside is crispy and browned and the inside is soft and fluffy. They sure are hard to resist! Combine the cornmeal, flour, sugar, baking powder, baking soda, cayenne pepper, and salt in a mixing bowl. In a separate bowl, whisk together the grated onion, egg, and buttermilk. Add to the dry ingredients, stirring just until combined. In a dutch oven or deep cast iron skillet, heat 2 inches of oil to 375 degrees F. When the oil is hot, use two spoons to drop batter into it by the tablespoonful, using the back of one spoon to push the batter into the hot oil all at once each time. The batter will immediately sink to the bottom of the pot for a few seconds, then pop up to the top. Fry for 3 minutes on one side, then turn and fry an additional 3 minutes on the other side, or until the hush puppies are golden brown, then remove from the oil and a tray lined with paper towels. Be sure to keep an eye on the oil temperature while frying so that it stays consistent. You may need to work in batches to fry all the batter.